Though little discussed, the Ukrainian soccer ultras have been an important force behind civil resistance in Ukraine. This might come as a surprise. Ultras are generally associated more with violence and hooliganism in and out of stadiums than with nonviolent resistance. Admittedly, the rise of ultras, as a purposeful political agent actively involved in defense of a popular revolution, has not been an entirely new phenomenon. The most recent example included the 2011 Egyptian revolution where soccer ultras played a crucial role in defending Tahrir Square, particularly during the Battle of the Camels. They fended off the government thugs that attacked them on camels. In contrast, the Ukrainian soccer ultras supported the nonviolent Maidan in Kyiv and did not join in violent clashes with the police when they occurred on a few days of the revolution. Ultras in Ukraine are easily mobilized for the games. 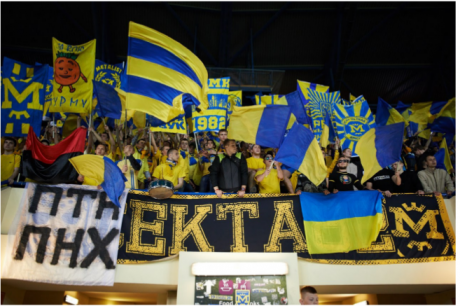 They hold an active online presence (the Ukrainian ultras’ Vkontakte group has around 50,000 followers); organize transportation and lodging; prepare banners, fan gear, and pyrotechnics; as well as making songs and chants for upcoming matches. Some ultra members would never miss an away game and will follow their teams to different countries if they can afford it. “Being an ultra is a way of life, a way of thinking. It’s when soccer is a lot more than just a hobby — it's your life!” explains the Ukrainian ultras website. Before the UEFA European Soccer Championship in 2012, which was held in Ukraine and Poland, Ukrainian ultras made great efforts to distance themselves from violence and hoodlums. They produced a film, “The Last Argument,” which, among other things, promoted a culture of “appropriate conduct” among the Ukrainian soccer fans and no alcohol ads during the soccer matches. “Youth need to be taught a healthy lifestyle and non-consumption of alcohol,” explained Yevgen Shchelkunov, one of the film directors, and an ultra. Ukrainian ultras have been an anti-establishment group, not affiliated with any political party, including the opposition. They became politically mobilized after 2011 when they launched nonviolent campaigns in support of Pavlychenki – a father and his 19-year-old son who were found guilty of murder of the Kyiv judge Sergii Zubkov in March 2011. Both were allegedly avenging their eviction ordered by the same judge a year earlier. Despite lack of compelling evidence and conflicting witness accounts, the father was sentenced to life imprisonment and his son to 13 years in prison. The latter, Sergii, belonged to ultras from the Kyiv soccer club “Dynamo.” United by their solidarity motto “One for all and all for one,” the ultras from several soccer clubs launched a coordinated campaign calling for their release. Hundreds of ultras gathered regularly to protest during bimonthly court hearings and organized marches, including the demonstration in Kyiv on November 25, 2012 with an estimated 5,000 protesters. Ultras would also bring “Free Pavlychenki” banners to soccer matches, and they would cover Kyiv with graffiti reminding passersby about the ongoing protest for Pavlychenki’s freedom. Ultras from other clubs would come to the capital to join the protests with their banners “Today Pavlichenki. Tomorrow you” and “Together — until the end!” The campaign continued until after the Maidan Revolution when the father and son were eventually freed from jail. By that time, ultras had gained more than two years of experience in activism, organizing nonviolent campaigns and building solidarity among their members around the country. These skills were used and also enhanced during the Maidan Revolution. When the Maidan Revolution widened after a violent dispersal of the peaceful student sit-in by the special police Berkut on November 30, 2014, ultras from different clubs declared their support for and solidarity with the protesters in Kyiv and other regions. According to ultras fan Oleg from the Simferopol soccer club “Tavria,” people from different regions came to Kyiv because they felt strong solidarity with the peaceful protesters who were brutally attacked. 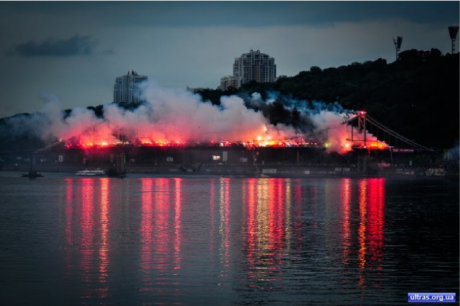 The Yanukovych regime became the ultras’ main opponent going forward. “We, the Ukrainian patriots, understood who was guilty in the country. We strongly objected when students were beaten. Especially, since ultras themselves had experienced police repression,” said Oleg. We are appealing to all who have not yet joined to defend Kyiv from hired thugs. Gather defense teams with cars for the night. You should coordinate with one another where you will meet, in case of emergencies and what escape routes you will use, if suddenly mobile communication and the Internet will be disconnected . . . Dress in such a way that will offer most security and safety. Each car should have a first aid kit. In Crimea and Donbas (Donetsk and Lugansk region), government-hired titushki organized a "hunt" for ultras. That did not deter the soccer fans that continued guarding the squares. In the second half of January, after the worst attacks by the authorities since Ukraine’s independence that saw four protesters killed, the soccer fans from Donetsk, Poltava, Odessa, Lviv, Lugansk, and other cities were galvanized. They issued open letters of support for the Maidan protesters in Kyiv and condemned the actions of authorities. In addition to expressing their support for Maidan, ultras of the Donetsk soccer club “Shakhtar” called for a boycott of the soccer events organized by their club. This was because its owner was the richest Ukrainian oligarch Renat Akhmetov, who was close to President Victor Yanukovych and his ruling party. Historically, there has always been animosity between soccer clubs in Ukraine. Specifically, fans of Kyiv’s “Dynamo” along with the ultras of Lviv “Karpaty" and Dnipropetrovsk “Dnypro” were involved in a running fight against fans from Odessa’s “Chornomorets” allied with ultras from Donetsk’s “Shakhtar" and Kharkiv’s “Metalist.” The solidarity among different ultras clubs to take on the Yanukovych regime developed spontaneously in the first weeks of the revolution, but it become formalized on February 13, 2014 when the ultras issued a joint statement announcing a formal “truce” among all soccer fan clubs. “We believe that to continue any confrontation between each other is a crime that will play out against ourselves and will eventually only worsen the current situation in the society,” read the ultras statement. 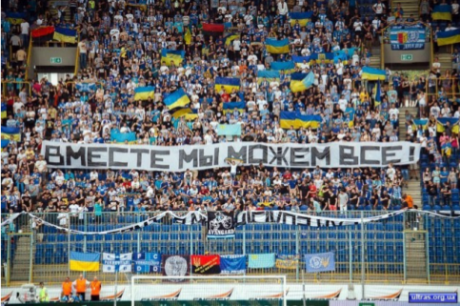 It further reminded everyone that, “The relationship between us should be based on the principle that we all are in the first place Ukrainians.” Provisions of non-aggression were also included, such as banning the street fights inside and outside the stadium, taking or burning banners, scarves and other attributes of the fans from the opposing teams, display of offensive banners and statements against each other or about the cities the fans were from. Furthermore, ultras emphasized that there would be strict enforcement of the non-aggression policies. “From Lugansk to the Carpathian Mountains — one fan to another is a friend and a brother" became a popular unity statement. It was printed on the stickers distributed in public spaces in different cities across Ukraine and showed the extent to which ultras had managed to overcome their internal divisions to face the threat of an autocrat, and later of a foreign-inspired aggression. Humor (sometimes expletive) has been on display during ultras’ public performances. The chants “Putin hu*lo.-lalalalalalalala” (Putin d***head) and calls for Russian President Vladimir Putin to keep his “hands off” Ukraine were heard from ultras of “Metalist” and “Shakhtar” and fans of other clubs during soccer games and unity marches. A song by the Belarusian political dissident band, Lyapis Trubetskoy, “Voiny Sveta” (Warriors of Light) was performed frequently during soccer matches and became an unofficial anthem of the Ukrainian fans. The song’s YouTube video with the images from the Maidan attracted 2.6 million views. On May 2, 2014 “Chornomorets” from Odessa was playing Kharkiv’s “Metalist.” Before the game, ultras from both clubs organized a march for Unity of Ukraine in the center of Odessa. They were unarmed, wearing their team colors and holding flags. The march was attacked by hundreds of masked thugs with bats, knives and small arms. Eventually, the sheer number of protesters pushed away provocateurs who fled to the local trade union building. As a result of a fire in the building, 40 pro-Russian separatists died. Although the circumstances of the fire are still being investigated, no one disputes the fact that violence broke out after a peaceful ultras’ march was attacked by armed groups. Two weeks after the tragedy in Odessa, on May 18, ten soccer clubs organized an initiative for “United Ukraine” that included a march on the Pedestrian Bridge in Kyiv, attended by approximately 3,000 soccer fans. A fire show with pyrotechnics and folk songs followed. 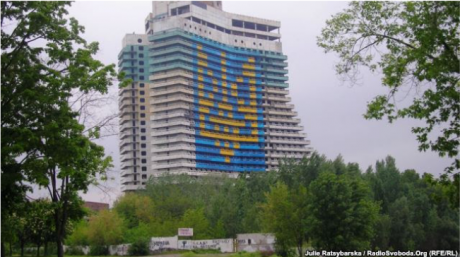 Meanwhile, in Dnipropetrovsk in eastern Ukraine, local ultras along with other activists painted the outside of the 16-story hotel “Parus” in the national colors that had the shape of the 20-meter-high (66 feet) Ukrainian emblem “Tryzub.” People donated paint and money, and those who could not offer either were asked to contribute their time to paint. With the efforts of around 50 people, the project was done in eight hours, leaving the huge imprint of Ukrainian identity on the city skyline. The ultras’ graffiti, such as “United Ukraine” and “Glory to Ukraine,” spread across cities in Ukraine. Ultras in Ukraine are more than just soccer fans. Beside a strong devotion to their teams (though not to the management of the soccer clubs that are owned by oligarchs), ultras across the country have mobilized for multiple national causes. Aggravated by the unfair justice system in Ukraine, they launched various civic, nonviolent actions when one of their own was put in jail. Thousands joined the pickets in front of city courts and participated in marches. Nonviolent tactics employed were marches, slogans, display of banners and graffiti — all bright and visible, in order to gain media attention and to not let the Pavlychenki case be forgotten. The Maidan Revolution brought mobilization of ultras to yet another level. Triggered by violence perpetrated by Berkut, ultras used their previous experience of organizing to launch campaigns to protect demonstrators against government thugs. Unity, solidarity and discipline helped Ukrainian fans to field effective campaigns around the country. Later, ultras became a vocal and visible force for a united Ukraine, organizing regular marches, protests, popularizing revolutionary songs, and deploying graffiti, banners, and stickers to advance their messages. Ukrainian ultras showed a remarkable degree of self-restraint and nonviolent discipline throughout the Maidan revolution and at the onset of the troubles in southern and eastern Ukraine. Although there are some worrying signs that more radical ultras will join newly created volunteer battalions to fight separatists and foreign militia in eastern Ukraine, ultras are likely to maintain their affirmative presence in pro-Ukrainian organizing in the months to come.